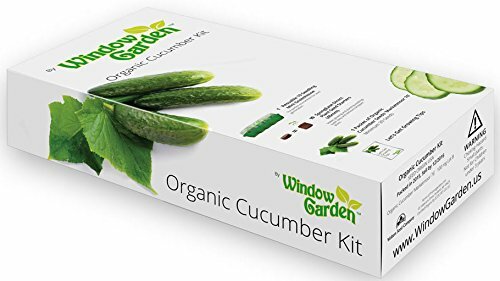 Window Garden Organic Cucumber Grow Kit - Easy To Grow Vegetable Seed Kit, Includes a 10 Cavity Mini Greenhouse, SpongEase Seed Starters and Non GMO Organic Seeds. SAVES MONEY - Don't buy expensive grown cucumber plants at the nursery. The Window Garden organic cucumber grow kit comes with everything you need to start your cucumbers by seed on your home windowsill. Easy to grow vegetable seed kit complete with non GMO organic seeds. The Window Garden Organic Cucumber Grow Kit is easy, convenient and designed for success for any skill level. Don't buy expensive plants at the nursery, grow them by seed and save! Great for all ages, get kids involved in growing nutritious organic food. Easy to follow and informative growing instructions with quality components make it easy to start your garden by seed. No need to buy different products like seeds or messy growing medium. When your seedlings are grown, just plant them directly into a planter or in your garden. Impressive Organic Cucumber Grow Kit with premium packaging, graphics and instructions make it a great garden gift for anyone or any occasion. Contains: 1 Ten Cavity Mini Greenhouse, 10 SpongEase Seed Starters, organic non GMO cucumber seed with complete instructions and growing information.